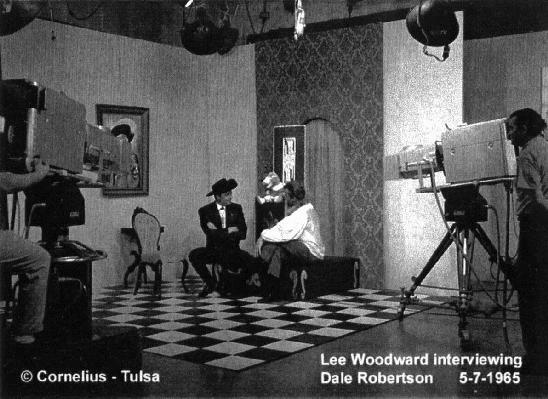 Lee Woodward and King Lionel are icons from Tulsa's TV history. Together, they hosted an afternoon movie, a so-called "kiddy show", and while Lee was the weatherman on KOTV channel 6, Lionel became a commentator on the newscast. 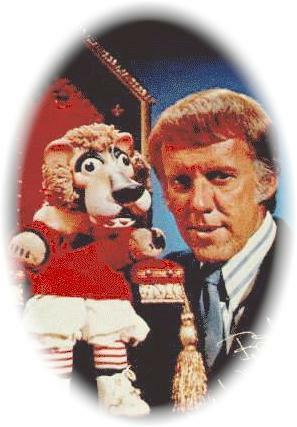 Having a sardonic lion puppet commenting on the events of the day might seem like a strange idea, but it's even more bizarre when you realize this was going on during the time of Vietnam, and Watergate. 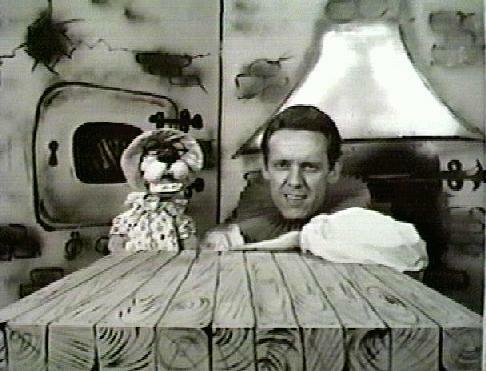 Lee, with and without Lionel, was a fixture on Tulsa TV for 26 years. Lee started as a radio announcer in Denton, Texas. In 1957 he took an offer as a booth announcer at KOTV. He first saw the puppet who would be king on the hand of a lady who was using it to host an afternoon movie at the station. She had Lionel working in drag as "Lippy The Lion." The show was soon canceled and "Lippy" was tossed into a storage bin. A year later, in 1958, Lee found "Lippy" while digging through the bin. Lee's job was to run commercials in the evenings so he took "Lippy" into the control booth to pass the time. Though he had never planned to be a ventriloquist, Lee began working with the figure, and playing around with voices. He joked that it was like "a Rod Serling movie, where the puppet is real and the guy is a dummy." Lee found Lionel's persona when he saw a nature show about lions, and it suddenly hit him that Lionel should be a king. Lee immediately let out a breath and said "Well" (on the inhale). At that moment, he discovered Lionel's deep, gravel voice. Within a matter of weeks, Lee and Lionel were doing bits on the afternoon movie. The hand puppet was a mass-produced reproduction of a marionette that was created by the famous puppeteer Bil Baird. The original figure, "Charlemane," worked with the legendary newscaster, Walter Cronkite on the CBS Morning Show in the early-fifties and had a supporting role in Baird's 1951 CBS Series The Whistling Wizard. Lee tracked down the company that mass-produced the hand puppet and bought the last remaining four for $4.95 each. While Lee's initial investment might seem small, over the years he indulged Lionel with a series of elaborate castles, the largest of which was eight feet across. Lionel was dressed in a robe and crown made of red velvet and pearls. "It would be impossible to do a show like that anymore," Lee said in an exclusive IP Interview. "Everything is syndicated now. Back then (in the late fifties and early sixties,) the station could buy Three Stooges shorts, or a western serial for very little money, and throw a host out there. If the host clicked - Boom! You had a show. "You could evolve, get a little better and a little bigger, and fortunately, that was something I was able to do; go from skits during the movie to a full-blown show. 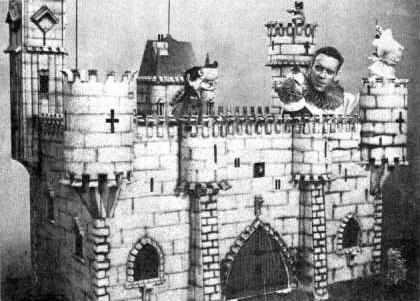 I built the big castle for Lionel and we had a great opening film sequence. A lot people thought it was a network show." Though he was showing Three Stooges shorts, Lee was aiming for an older audience. "Our afternoon show was the lead-in to The CBS News with Walter Cronkite; it was the best possible time for us. What we were doing was mostly for high-school and college student, and young adults. I knew they were hip and that they knew what was going on, and that they could see through a lot of stuff that I could see through. Our show was not really a kiddy show." Lee & Lionel were a huge local sensation for six years. "The weekday show eventually dissolved because Channel 6 replaced us with The Mike Douglas Show, which was the first big syndicated show," Lee said. The Mike Douglas Show hit nationally in 1964. It was a celebrity talk show that featured everyone from soap opera stars to President Nixon. "KOTV wanted the same demographic; the 35-year-old Muskogee housewife. My counter to that was that I already had her through the kids watching us. But they booted us off weekdays, so we tried it on Saturdays and it just died. 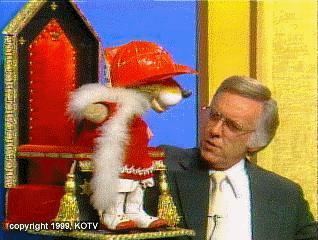 We had great guests coming in to chat with Lionel (like Bob "Gilligan" Denver and Captain Kangaroo). We had a great set, but the people who wanted the news bits and the social commentary, my audience, was gone." After the show was canceled, Lionel became stronger when he began to show up on KOTV's local newscast. "Lionel could say things about the news, or people in the news, that I couldn't get away with." Lionel seemed to have a slightly left-wing bent to his satire. "Channel 2 had always been pretty conservative," Lee said, "and 8 was neutral. Channel 6 just seemed to attract people who were a little out there, or to the left. I can think of a number of news people and cameramen who were WAY left, but I don't think their bias necessarily showed." I asked if there was ever any complaints about Lionel's commentary. "There were some complaints to management, never to me personally, except for one old man I ran into in the library who was assailing me for being on the news with Lionel. He thought that was ludicrous, which it may have been. People would comment on the fact that Lionel spoke truthfully about people in the news in a comical, Mort Sahl way, but we had very few complaints." Rock 'n' Roll Circus guitarist Sean Standingbear, whose parents were friends of the Woodwards, once mentioned some R-rated "blue" shows that Lionel did privately at cocktail parties in the 1960s. I asked Lee if the story was true. "Probably," Lee laughed. "We would go to one person's house or another, including mine, and as the evening progressed, Lionel would get a little livelier. Sean might have been in better shape than I was to remember it." While Lee & Lionel were television stars, they also made appearances with the Philharmonic. Lee was a voice major in college. "We did thirty Pops concerts with the Tulsa Philharmonic at the Old Lady on Brady. We did things like Peter & The Wolf and The Man Who Invented Music- all of the children's pieces. We took the big castle down to the Brady Theater, so when they pulled the curtain back, here was the castle and Lionel, and myself - the crowd would go crazy. And the audience would really get into it. We would deviate from the scripts obviously. We used to plug the Tulsa Opera on the news, and Lionel would do arias. Lionel was always plugging the arts and humanities in town." The end of Lionel's career came in the late seventies. "The company that owned KOTV at the time wanted to get rid of Lionel. We would send them these tapes up to New York and they were embarrassed to show the sales representatives their newscast in Tulsa with this lion and this weatherguy making social commentary," Lee said. Lionel was taken off the air, which was followed by a local uproar. He returned briefly, but he was kept from interacting with the rest of the anchormen. The end of Lee's career as a weatherman started in 1978 when Channel 2 brought in Gary Shore, a credentialed meteorologist. "I was an educated amateur. But when Gary came on and told Tulsa it was going to get a little snow that night, and the weather service was saying we were not going to have snow, and nobody else predicted snow, and he hit it, that was it. From then on, every station had to have a meteorologist. I could see the writing on the wall, and so I eased into the luxury car business." Lee's last broadcast came in 1983. Unfortunately, like most local television of the era, very little of Lee and Lionel had been preserved. "Most of what is left of Lionel is on 16-millimeter film, like when we took him into the barbershop at Park Plaza and had the barber give him a haircut. I've got that, and some other pieces of film, a few snippets of tape from the newscast, but nothing from the old show." and more on KJRH's "Oklahoma Memories"! Lionel and "Grandma Lion" (another of the four "Charlemane" figures, dressed in a white wig and a motorcycle jacket) sit proudly displayed in the Woodwards' home. I asked Lee what his relationship is like with Lionel these days. "If I have my grandkids, sometimes I will bring Lionel out. The first time I did that with one of my granddaughters, it scared the hell out of her. To be honest with you, I can't get my fat hand in him comfortably anymore," Lee laughed. "I really haven't been on TV since 1983, but not a day goes by that people don't come up to me. Usually what they say is 'How's Lionel,' not 'How are you?' It's amazing. I know I've changed considerably, but they still recognize me, and I get that from all over the United States, because people scatter. It's phenomenal to me." Lee is retired now. He and his wife have a lovely home in the central section of the city. Lee is surrounded by his paintings and sculpture, and he still sings. It's good to know that on some evenings, when Lee's grandchildren are around, Tulsa's King is still holding court in the center of his township. recorded April 2001... a TTM exclusive! For a more detailed account of Lee's long and distinguished career, check out his memoirs on Mike Ransom's terrific Tulsa TV Memories website at http://tulsaTVmemories. Mr. Ransom was a great help in researching this article. Text printed by permission, © 2001, Infinity Press. All rights reserved.